Make yourself at home in one of the 25 guestrooms. Complimentary wireless Internet access keeps you connected, and cable programming is available for your entertainment. Bathrooms have showers and complimentary toiletries. Conveniences include coffee/tea makers, and housekeeping is provided daily. Satisfy your appetite for dinner at the hotel's restaurant, The Conservatory, or stay in and take advantage of the room service (during limited hours). Quench your thirst with your favorite drink at the bar/lounge. Full breakfasts are available for a fee. With a stay at Whinhill Gate Apartments in Aberdeen, you'll be convenient to Duthie Park Winter Gardens and Academy. This apartment is within close proximity of Aberdeen Music Hall and St. Mary's Roman Catholic Cathedral.Rooms Complimentary wireless Internet access is available to keep you connected.Business, Other Amenities Free self parking is available onsite. With a stay at Village Hotel Aberdeen in Aberdeen (Kingswells), you'll be within a 15-minute drive of Aberdeen Royal Infirmary and Robert Gordon University. This spa hotel is 4.8 mi (7.7 km) from His Majesty's Theatre and 5.7 mi (9.3 km) from University of Aberdeen. 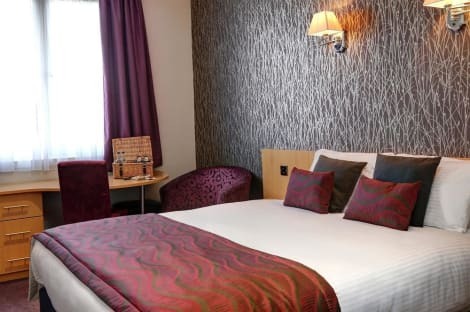 A bright, modern hotel in Aberdeen's bustling West End, with WiFi and breakfast included Holiday Inn Express® Aberdeen City Centre hotel is right in Aberdeen's West End, half a mile from the main rail and bus stations and 20 minutes by taxi from Aberdeen Airport (ABZ). The hotel is just around the corner from Union Street, Aberdeen's premier shopping destination with lively bars, restaurants and theatres. Doing business in Aberdeen? 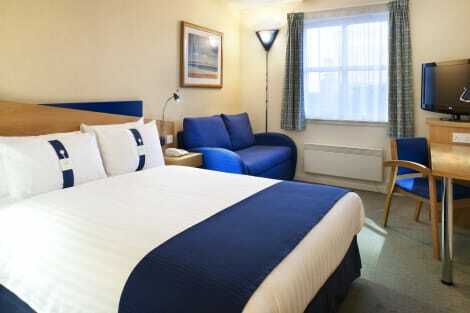 The hotel is located close to regional offices for Shell, Total and Statoil. Two modern meeting rooms host 35 people each, with free WiFi, natural light and air conditioning. Freshly brewed tea and coffee, plus a lunchtime buffet option, will keep meetings productive. It's a 10-minute walk to Aberdeen's stylish Union Square shopping centre. If you fancy seeing a show, His Majesty's Theatre is just five minutes on foot. Farther afield, you can explore Aberdeenshire's Castle Trail, or visit the region's whisky distilleries – ask friendly hotel staff for tips. For golfers, the hotel is three miles away from Royal Aberdeen Golf Club, while Trump International Scotland is only half an hour's drive. All guests enjoy free WiFi and an inclusive buffet breakfast with selected hot items. The hotel's lobby bar offers an excellent range of malt whisky, plus draught beer and wine.